For the village in India, see Digger, Leh. The Degar, also known as Montagnard, are the indigenous peoples of the Central Highlands of Vietnam. The term Montagnard means "people of the mountain" in French and is a carryover from the French colonial period in Vietnam. In Vietnamese, they are known by the term người Thượng (Highlanders)—this term now can also be applied to other minority ethnic groups in Vietnam or Người dân tộc thiểu số (literally, "minority people"). Earlier they were referred to pejoratively as the mọi. The term "Degar" is generally used only by people connected with Kok Ksor and the Degar Foundation. Most of those living in America refer to themselves as Montagnards, while those living in Vietnam refer to themselves by their individual tribe. Below is a list of officially recognized ethnic groups in Vietnam that are indigenous to the Central Highlands and nearby areas, with a total population of approximately 2.25 million. They speak Austroasiatic languages of the Katuic and Bahnaric, as well as Chamic languages (which belong to the Austronesian language family). Population statistics are from the 2009 Vietnam Population Census. A Montagnard tribesman during training in 1962. In 1962, the population of the Degar people in the Central Highlands was estimated to number as many as one million. Today, the population is approximately four million, of whom about one million are Degars. The 30 or so Degar tribes in the Central Highlands comprise more than six different ethnic groups who speak languages drawn primarily from the Malayo-Polynesian, Tai, and Austroasiatic language families. The main tribes, in order of population, are the Jarai, Rade, Bahnar, Koho, Mnong, and Stieng. Originally inhabitants of the coastal areas of the region, they were driven to the uninhabited mountainous areas by invading Vietnamese and Cambodians beginning prior to the 9th century. French missionaries converted some Degar to the Catholic Church in the nineteenth century, but American missionaries converted more to Protestantism in the 1930s. Of the approximately one million Degar, close to half are Protestant, and around 200,000 are Roman Catholic. This made Vietnam's Communist Party suspicious of the Degar, particularly during the Vietnam War, since it was thought that they would be more inclined to help the predominantly Christian American forces. In 1950 the French government established the Central Highlands as the Pays Montagnard du Sud (PMS) under the authority of Vietnamese Emperor Bảo Đại, whom the French had installed as nominal chief of state in 1949 as an alternative to Ho Chi Minh's North Vietnam. In the mid-1950s, the once-isolated Degar began experiencing more contact with outsiders after the Vietnamese government launched efforts to gain better control of the Central Highlands and, following the 1954 Geneva Accord, new ethnic minorities from North Vietnam moved into the area. As a result of these changes, Degar communities felt a need to strengthen some of their own social structures and to develop a more formal shared identity. When the French withdrew from Vietnam and recognized a Vietnamese government, Degar political independence was drastically diminished. The Degar have a long history of tensions with the Vietnamese majority. While the Vietnamese are themselves heterogeneous, they generally share a common language and culture and have developed and maintained the dominant social institutions of Vietnam. The Degar do not share that heritage. There have been conflicts between the two groups over many issues, including land ownership, language and cultural preservation, access to education and resources, and political representation. In 1958, the Degar launched a movement known as BAJARAKA (the name is made up of the first letters of prominent tribes; similar to the later Nicaraguan Misurasata) to unite the tribes against the Vietnamese. There was a related, well-organized political and (occasionally) military force within the Degar communities known by the French acronym, FULRO, or United Front for the Liberation of Oppressed Races. FULRO's objectives were autonomy for the Degar tribes. 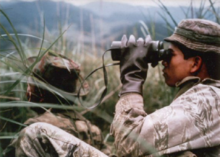 As the Vietnam War began to loom on the horizon, both South Vietnamese and American policy makers sought to begin training troops from minority groups in the Vietnamese populace. 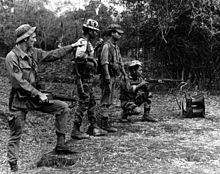 The U.S. Mission to Saigon sponsored the training of the Degar in unconventional warfare by American Special Forces. These newly trained Degar were seen as a potential ally in the Central Highlands area to stop Viet Cong activity in the region and a means of preventing further spread of Viet Cong sympathy. Later, their participation would become much more important as the Ho Chi Minh trail, the North Vietnamese supply line for Viet Cong forces in the south, grew. The U.S. military, particularly the Special Forces, developed base camps in the area and recruited the Degar. Because of their quiet resolve and skills in tracking, roughly 40,000 fought alongside American soldiers and became a major part of the U.S. military effort in the Highlands and I Corps, the northernmost region of South Vietnam. In 1967, the Viet Cong slaughtered 252 Degar in the village of Dak Son, home to 2,000 Highlanders, known as the Đắk Sơn massacre, in revenge for the Degar's support and allegiance with South Vietnam. In 1975, thousands of Degar fled to Cambodia after the fall of Saigon to the North Vietnamese Army, fearing that the new government would launch reprisals against them because they had aided the U.S. Army. The U.S. military resettled some Degar in the United States, primarily in North Carolina, but these evacuees numbered less than 2,000. In addition, the Vietnamese government has steadily displaced thousands of villagers from Vietnam's central highlands, to use the fertile land for coffee plantations. Montagnard and Chinese officers from 1976 and 1979 were purged from the Vietnam People's Army. Vietnam's south and center highlands were subjected to systematic state backed colonization by ethnic Vietnamese Kinh and the Central Highlands people experienced ruin and brutality during the Vietnam War. Outside of southeast Asia, the largest community of Montagnards in the world is located in Greensboro, North Carolina, US. The native inhabitants of the Central Highlands are the Degar (Montagnard) peoples. Vietnam conquered and invaded the area during its "march to the south" (Nam tiến). Ethnic Vietnamese (Kinh) people now outnumber the indigenous Degars after state sponsored colonization directed by both the government of South Vietnam and the current Communist government of unified Vietnam. 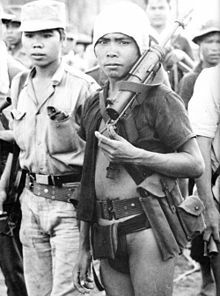 The Montagnards have fought against and resisted all Vietnamese invaders, from the anti-Communist South Vietnamese government, the Vietcong, to the Communist government of unified Vietnam. ^ Kelly, Francis John (1989) . History of Special Forces in Vietnam, 1961-1971. Washington, D.C.: United States Army Center of Military History. pp. 6–7. CMH Pub 90-23. ^ Big Picture: Operation Montagnard. U.S. Army Audiovisual Center. 1966. ^ Stephen Peter Rosen (1996). Societies and Military Power: India and Its Armies. Cornell University Press. pp. 219–. ISBN 0-8014-3210-3. ^ James A. Anderson (20 December 2012). The Rebel Den of Nung Tri Cao: loyalty and identity along the Sino-Vietnamese frontier. University of Washington Press. pp. 172–. ISBN 978-0-295-80077-6. ^ "MONTAGNARDS" (PDF). August 2008. Sidney Jones, Malcolm Smart, Joe Saunders, HRW. (2002). Repression of Montagnards: Conflicts Over Land and Religion in Vietnam's Central Highlands. Human Rights Watch. ISBN 1-56432-272-6. United States Congress. Senate. Committee on Foreign. (1998). The Plight of the Montagnards: Hearing Before the Committee on Foreign Relations, United States Relations, Original from the Library of Congress . Condominas, Georges. We Have Eaten the Forest: The Story of a Montagnard Village in the Central Highlands of Vietnam. New York: Hill and Wang, 1977. ISBN 0-8090-9672-2. Montagnard Foundation. Human Rights Violations: Montagnard Foundation Report, 2001: Report on the Situation of Human Rights Concerning the Montagnards or Degar Peoples of Vietnam's Central Highlands. Spartanburg, South Carolina: The Foundation, 2001. Montagnard Foundation. History of the Montagnard/Degar People: Their Struggle for Survival and Rights Before International Law. Spartanburg, South Carolina: The Foundation, 2001. Wikimedia Commons has media related to Degar people. This page was last edited on 17 January 2019, at 10:23 (UTC).